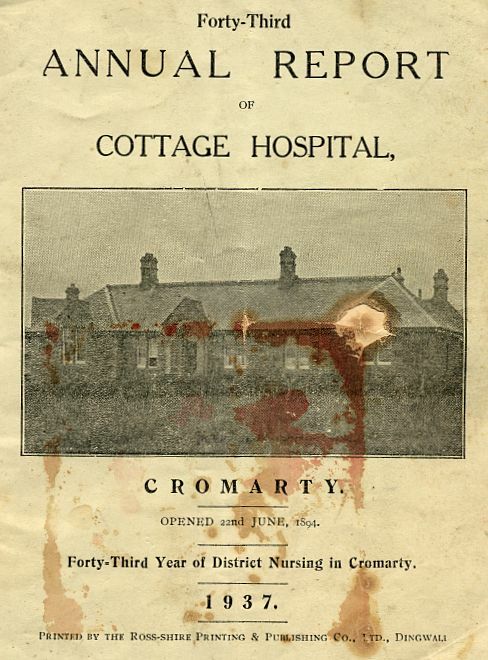 Forty-Third Annual Report of Cottage Hospital, Cromarty. Opened 22nd June 1894. Forty-Third Year of District Nursing in Cromarty. 1937. Printed by the Ross-shire Printing & Publishing Co., Ltd., Dingwall. The Sherriff of the County. The Parish Minister of Cromarty. Dr GG Middleton of Davidston, Cromarty. WFB Scott Esq, Rosenberg, Cromarty. Chairman of Governors - GDN Ross Esq of Cromarty. Chairman:- Dr GG Middleton of Davidston. Miss AA Murray, St Ann's, Cromarty. The booklet also contains a two page written report and tables of information about patients, accounts and donations. The Managers of Cromarty Cottage Hospital and Nursing Association have pleasure in submitting the Forty-Third Annual Report. Twenty-three cases were treated in the Wards of the Hospital during the year, of which number, nine were Maternity cases. The Nurs paid 2451 District visits and 2035 visits were paid by patients to the Dispensary. The balance brought forward as at 15th May, 1936, was �92 7s 5d. Income for the year amounted to �280 103 5d, included in which, and apart from the ordinary subscriptions and donations, are the sums of �100 Grant from the Ross-shire (Mainland) Federation of District Nursing Associations; £25 from Cromarty Literary Society, being proceeds of Concert by Harmonica Band of H.M.S. "Rodney"; �7 11s, proceeds of Whist Drive and Dance organised by Mr Bracewell and crew of s.s."Osterhav"; �4 4s, donation from Cromarty Firth State Management Districe, and �28 1s 4d Interest on Investments. Expenditure during the period amounted to £343 11s, leaving a credit balance of £29 6s 10d to be brought forward to the new year. The Managers expressed their deep regret at the death on 4th January last, of Mrs M. D.J. Urquhart, widow of the late Mr George Craigie Urquhart of Castlecombe, Sutton, Surrey. Mr and Mrs Urquhart always held the interests of the Hospital very near to heart, and the Managers wish to record their gratitude at the legacies falling to the Institution under Mr Uquhart's will, (1), £500; (2), £1000 to endow and maintain, as far as possible, a bed in the Hospital to be known as the "George Craigie Urquhart Bed" and (3), One-third share of the residue of the estate. The Managers record their appreciation of the splendid service rendered to the Hospital by Dr Gibson during the years he acted as Honorary Medical Attendant, and the regret they feel in accepting his resignation at this time. They are also indebted to Nurse Ross for her valued work in the Hospital and District, and to Miss Ross for so efficiently managing the domestic arrangements. They express a warm welcome to Dr Gillanders, who, since Dr Gibson's departure, has acted as Honorary Medical Attendant with great acceptance. The Managers again thank everyone who has contributed to the support of the Institution in any way, and earnestly solicit continuance of this assistance. Very Interesting Garve ..I was born there in 1947 ..I take it the that the Dr Gillanders mentioned in the managers for 1937-38 ..was the same Doctor that was around Cromarty ..and had his surgery in Church street next to the Cromarty Arms Hotel ..in the late 50's early 60's ? Hello John, It's Clem here, yes it was the same Dr Gillanders in the 1930's thro' until the 50's, he in turn had a son Louis, who went on into medicine, qualifying as a Doctor, and continued in practice as a Professor/Surgeon, dying, about three years ago. I recall seeing a newspaper article about him at that time. Yes Clem Dr Gillanders used to come out to Jemimaville to see patients. There was a unique system in place. If anyone wanted the Doctor they went down to Scott's garage and Hugh snr or James would telephone and the doctor arrived in the afternoon [if non urgent]. Louis attended me once when I had tonsilitis. Dr Gillanders was a lovely man who would sit by your fireside and have a cup of tea. Also published in the small booklet/report is an entry, and I still have the receipt, to say that the cost for my mother's 14 day internment after my birth, cost the princely sum of £14-14/-, in today's money £1.05p per day. A week for the same period in Raigmore today would be £6000!! I was born at this hospital on 7 October 1941. Birth certificate shows my names as Anthony Eden WEIR. However, I was given up for adoption at three weeks in South Africa. My biological father was a Bombardier in a regiment which was based at Cromarty during the 2nd world war. Does anyone remember Weir's in Cromarty at that time, or know where I might find more information. To date no one has been in contact with me regarding my birth at the Cromarty Hospital on 7 October 1941. I reside in Port Elizabeth South Africa and would be most interested to trace my biological family history. I see that I wrote on 4 June 2008 last. Please could someone help with a little bit of information. Both myself and my husband were born in the hospital and we now live here in the former hospital now known as Gisborne. The hospital closed in 1954 and became a residence in 1956. I am not sure where relevant paperwork about the hospital is kept. The local registrar at the time of your birth would have been Essie Harries and her books and records would I think, be transferred to the registrars office in Dingwall.